Soaring into the Circle comes Ladybird – Meet this well-established Montessori pre-school soon to be nearby! I’ve had the opportunity to write about the two new schools opening in JVT this coming fall. And this got me thinking. What about the pre-schoolers? Certainly, many Moms like to stay at home with their youngsters as long as they can. Yet, in all reality, a lot of us wish or need to get back to work and can’t bring the toddlers along. Therefore, when I heard that a new nursery school was opening its doors soon in JVC, just across the road, I thought I should find out more. Ladybird Early Learning Centre will be welcoming the youngest of our broods beginning at age 6 months. A fully equipped facility, Ladybird will play home to young ones until aged 5 years old when it would be time to enroll your child in the primary school of your choosing. The exciting news, I believe, is that Ladybird is affiliated with our own JVT primary, The Arcadia Preparatory School. 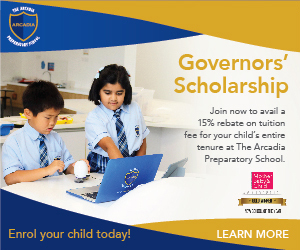 As a ‘sister school’, students from all Ladybird branches will be given priority admission into Arcadia. This, in effect, means guaranteed admission for FS1 and preferred admission beyond FS1. In Dubai, this is a huge plus as most parents would know. The new pre-school is set to open later this summer. The facility is nearly complete. The lights and air conditioning are already functioning (a good thing with this heat! ), the outdoor play equipment is already fitted and the final touches are in process. It’s expected to be completely finished at the end of May. Tours are being arranged on June 11th between 10.00 – 1.00pm and interested parents should contact the school to get a peak inside! Ladybird has a capacity of 216 children. The administration has told me that they have chosen to keep it exclusive despite the ample size of the space. Ladybird’s Early Learning Centre is 24,000sq ft on a 47,000sq feet plot with state of the art facilities and fully qualified teachers, some of who I learned have been with the company for over 15 years. Designed with safety in mind, this early learning center is a ground floor only facility designed by world-class architects. At the JVC facility, they are targeting to be the only LEED Gold certified nursery in the region and one of the few in the world, making theirs a truly green building that will provide a healthy environment for the children. “The safety and well being of our children has always been a top priority at Ladybird,” emphasized Monica Valrani, CEO of Ladybird Nurseries. With a top quality facility, parents could come from far across the city. With few options in our immediate vicinity, the school should attract families living in Jumeirah Village, Dubai Sports City, Jumeirah Park, Jumeirah Islands, Al Barsha, and Emirates Living. I think it’s a plus to have so many new school options nearby as your child’s out-of-school social life can also remain close to the neighborhood. As well, the pre-school hosts plenty of events. I was told all about their International Day, Mother’s Day tea, Concerts, and Festival celebrations where parents are invited to participate and interact with each other. “Ladybird Early Learning Centre works with our parents as partners,” Monica assured me. Pre-school age is time when parents bond with other parents so it was very comforting to hear about all these additional activities that Ladybird hosts. As any good school in Dubai, Ladybird is not behind the times in terms of technology. Their private parent portal provides a clear understanding of what the children are learning. Teachers post their weekly timetables and notices followed by a summary at the end of the week with some pictures taken in class. Parents can access their child’s weekly planners, weekend reviews, photo gallery, events and calendar. These can also be accessed using the Ladybird App available for download on both Android and IOS platforms! Smart Dubai! It’s good to know that while the Ladybird Nursery may be new to JVC, they are not new to Dubai. Their first school opened in Jumeirah 1 in 1996. They have long had a school branch in Umm Suqeim but given rent increase on the premises staying there was no longer feasible. “With the JVC facility, we own the land and building and therefore will never be in such a situation again,” noted Monica. I learned a lot talking to Monica. Ladybird Nursery is one of the pioneers to impart a world-class Early Years Foundation Stage (EYFS) curriculum in a Montessori setting here in Dubai. The essence of Montessori education is that every child is treated with respect, given freedom within the limits of a carefully structured environment and allowed to develop naturally at his or her own pace. In a Montessori classroom the children choose from a wide range of self-educating and self-correcting activities, working with each piece of equipment for as long as he or she needs to. The Montessori classrooms are carefully prepared to encourage a child’s own natural desire to learn. The child’s love of learning is encouraged by giving him or her the opportunity to be spontaneous and engage in meaningful activities under the guidance of a trained teacher. Through their work, children develop concentration, motivation, persistence, discipline and a lifelong love of learning. With the Montessori program, Ladybird will also be offering a whole host of enrichment learning and activities including an absolutely unique water play area that has been flown in from the United States! I really enjoyed hearing all about the program at Ladybird and I hope JVT parents have gained a lot of insights about their plans from this story. I really felt the passion Monica has for her early learning center and she encapsulated this by expressing how they “have been proudly preparing children to move on to ‘big’ school for two decades” as 2016 marks their 20th year in operation. Any information on the nursery can be provided by calling them on 04-3465240.